Whether you’re looking for a seaside dinning experience at a first class restaurant, or you enjoy the sport of cooking what you catch, the coastal water of Maine will give you the taste of New England at its best. 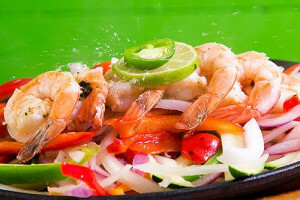 Unique specialties: Lobster Quesadillas and Shrimp Fajitas - fresh from the sea. On Main Street in downtown Bar Harbor! Join us for lunch and dinner, all year. Serving Lobster Mac n' Cheese, chicken tenders and wings, pretzels and many other favorites, add to them one of our many craft beers. Available samples or full flights. Upscale food in a casual atmosphere, located in downtown Bar Harbor. 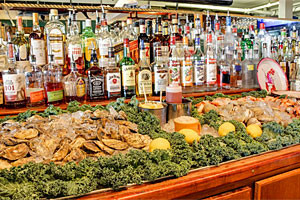 Fresh local seafood is featured for lunch and dinner along with unique cocktails. Our cafe prides itself on using as many naturally-sourced fruits, vegetables and local seafood to provide you the tastiest experiences in Bar Harbor. 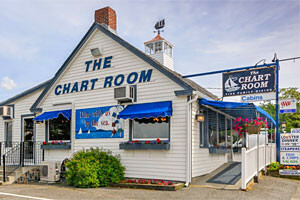 The Chart Room - Where The Locals Dine! 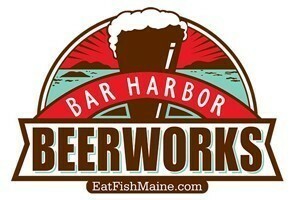 Just 2 miles from downtown Bar Harbor in Hulls Cove, we've been a local's favorite for over 20 years. Amazing fresh seafood, perfectly prepared, w/on the water seating. Taste the Delicious sea food on the sides of the shores along with the tides of the sea in the Bar Harbor only at Cafe Bluefish. Enjoy lunch or dinner in this historical building located near the Bar Harbor waterfront. Fine dining with the freshest of ingredients and top notch service. Enjoy the fresh and delicious seafood provided by the lovely Portside Grill! Lunch, dinner, and take out options are all provided! Experience the way lobster is meant to be eaten! Cooked outdoor in seawater over a wood fired cooker! Packed for Travel or Shipped Nationwide to your door! Intimacy coupled with hospitality, West Street Cafe is open 7 days a week offering traditional sea foods, along with fresh and salty breeze of the sea. Maine seafood is more than Lobster and Clams. 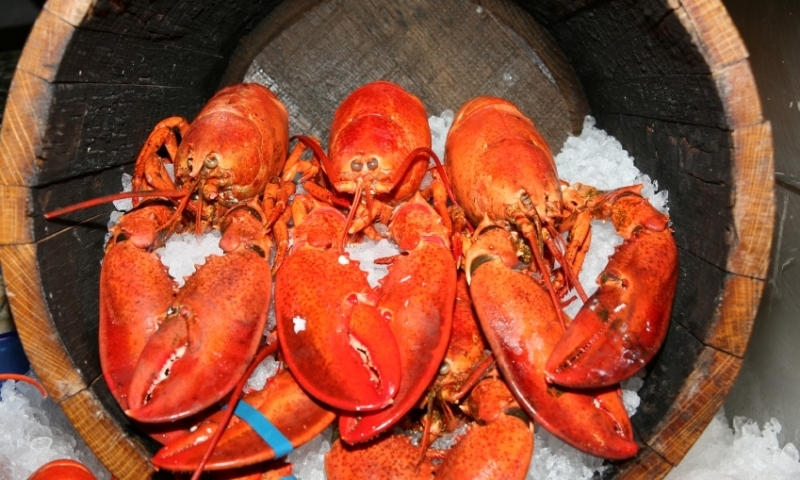 Experience a true variety of Maine seafoodwhile visiting Acadia and surrounding villages! Fishing has always been one of Maine’s largest industries. 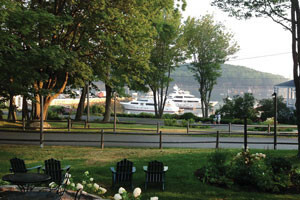 The village of Bar Harbor offers visitors the opportunity to enjoy many dishes directly from the ocean. From the famous Maine lobster, to local mussels, and clams, or freshly caught fish, the restaurants of Bar Harbor offer varied and exciting seafood options. Many of the restaurants are directly on, or near the seashore, providing a unique and enjoyable dining experience. 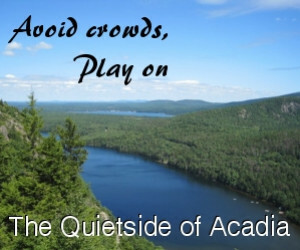 Whether you’re looking for a quaint hideaway, an entertaining night spot, seaside dining, mountain views, or a flavor specialty, the variety of choices in Bar Harbor and surrounding communities are bountiful. Just as bountiful is the Maine lobster. Famous around the world, almost every restaurant in Bar Harbor can offer its patrons a standard lobster dinner. Some dinning advise, Soft shell lobsters are easier to eat than hard shell lobsters because they have shed their old shell and the new one has not yet hardened. Another important fact is that smaller lobsters are more tender and sweet than larger lobsters. Visitors can also try many varieties of lobster dishes including lobster rolls, lobster bisque, and even lobster ice cream. By buying Maine seafood, visitors can also support local fishermen and a cultural livelihood. 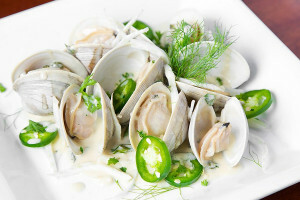 If you wish to try something else, many places offer local clams, both hard and soft shell, or steamers. Most people agree that Maine clams are different and more tastier than the small necks from southern New England. Mussels are also prepared in a variety of ways. Mussels are slightly tougher than clams, but full of flavour. 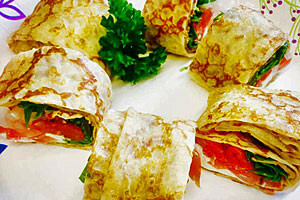 Other local seafood recipes include Salmon, Halibut, Striped Bass, Shrimp, Cod, Haddock, Pollack, Flounder, and Mackerel. Famous in Maine is the traditional New England clam chowder and New England style Fish Chowder, a hearty mix of complimentary fish flavours. Find these at varied locales or try a home cooked version. 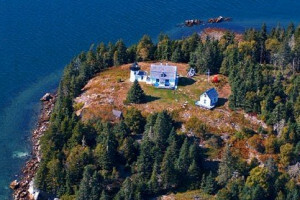 Maine offers the possibility to catch the catch yourself. Salt water fishing does not require a license in Maine, however, new in 2010, a salt water fishing registry is being implemented. Anyone recreationally fishing in salt water in Maine should check to see whether they must register with the National Saltwater Angler Registry. Registering is free and can be done online. Fishing is allowed in Acadia National Park. Some suggested areas are Sargent Drive, Somes Sound, Frazer Point and the Schoodic Peninsula. It is advised to be cautious while fishing along the coastline as large waves can unexpectedly hit the shore and the coastal rocks are extremely slippery. Pier fishing in Bar Harbor is also an option. Always check with the park service, or local municipalities for seasonal restrictions.